It's rare to find good quality hand crafted goods nowadays. East is East Boutique Markets is a new market held on the first Saturday of each month, featuring a wide variety of hand-made local products ranging from tea towels to paper crafts, jewellery, brooches, clothing, ceramics, candles and more. There's also a strict price cap of $80 and no overpriced imported goods. Many of the local artists also sell their products online, just click on the links in the article below for more information. The market is located inside the Masonic Hall on 199 Anzac Parade (opposite Doncaster Hotel), where visitors can enjoy their time browsing the artist's work safely indoors without being affected by the terrible rain. Featuring roughly 16 stalls, this is the perfect place to find unique gifts and additions for the home. Badger Lane was the first stall that caught my eye. It features printed T-shirts (kids $15, adults $20), tea towels ($15), hair scrunchies, greeting cards ($5), badges ($1-$5) and dresses ($60), all made by 2 sisters. Notable designs include the badger at a sewing machine, the Russian doll, as well as tea towels outlining how to tie knots and various instruments. If you want to learn how to be crafty like the 2 sisters from Badger Lane, check out the classes on offer. 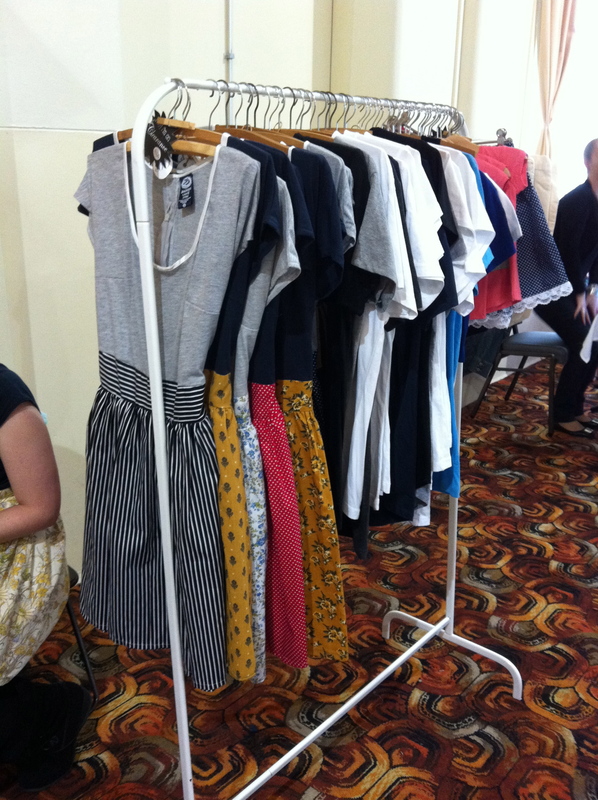 Past events include sewing classes and screen printing workshops. The Whimsy Milieu stall features a whimsical and fun jewellery range by Sydney-based designer Jacqueline Chan, my favourite being the adorable bunny rabbit and bear cat rings. Mopoke Designs specialises in tote bags, shoulder bags, cosmetic bags, pouches and clutches which are all hand made by Belinda. Mopoke is actually an owl, which is also featured on several products! The pouches are super cute and shoulder bags intricate and suitable for all occasions. Another notable mention would be Alex Falkiner's stall, where you can find colourful rope baskets, romantic tea towels and entertaining hand-drawn zines. For those into ceramics and pottery, the market also features work by local potter Denise McDonald. Paper Lions sells pretty and charming greeting cards, featuring old school bathers, as well as ones with hand-sewn snowflakes. SmartAlex Textiles offers 100% linen hand-printed tea towels as well as adorable peg bags and journal covers. The three bird theme is featured heavily in the series on sale. The most fun and quirky stall would have to be Beep Bike Bells! Unfortunately I don't own a bike, but for those who own one or know a bike enthusiast who collects bike bells, then these are the perfect gifts! Cleverly displayed on cupcake stands, these bike bells come in solid colours ($14), two colours ($15) or hand painted with a special design ($23). 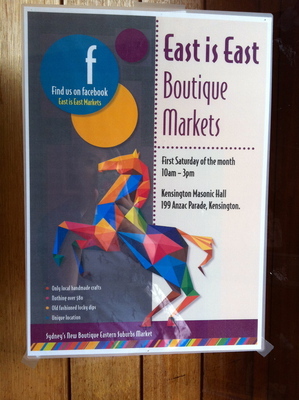 The next East is East Boutique Markets is held on March 2nd (first Saturday of each month) from 10am-3pm. Come celebrate the local hand-made arts and crafts culture! I love the bike bells; I've never known anyone to do something like that before.